Sometimes, we get so caught up in the everyday haze of our lives — obsessing over our next goal or training endeavor, the next “big thing” we’re working on, and so on and so forth — that we forget to just live and most importantly be happy. Our lives can be lived a little bit better; each day a little sweeter if we stop and appreciate what we already have. It can be a difficult thing to do, but living in the present moment and focusing on happiness is important. It really makes a difference in overall well-being and health. From a personal standpoint, I’ve realized that once I started to prioritize living in the moment and stopped always obsessing and planning what would happen next (especially over the last few months), I became a much happier person. That’s why this quote struck me so much. This life is amazing. And there are so many things that we can do with it. Once we realize that and stop obsessing over what’s to come — by pausing in the constant pursuit of happiness — lots of great things can come with it. 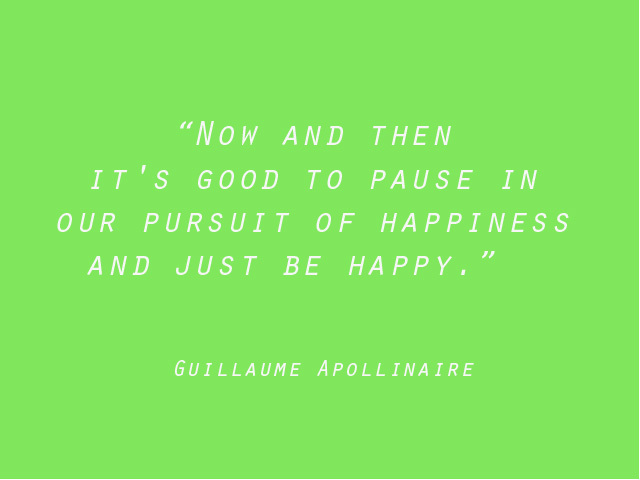 What can you do in your everyday life to pause — even for a moment — and just be happy?